The process of using algae to produce biofuel is getting a lot of attention from major companies, such as Chevron and Shell, and small start-ups, due to its huge potential. Any way you look at it, the numbers are staggering: With oil prices at $110 a barrel, and the U.S. importing about 10 million barrels of crude oil a day, each and every day some $1.1 billion is leaving the United States to pay for foreign oil. That amounts to $46 million every hour. This represents a huge transfer of money out of the U.S. And then there is the much talked-about national security aspect. While some of that oil is coming from countries friendly to the U.S.-Canada and Mexico, for example-a large amount is coming from less than amiable nations that are not exactly stable. In recent years, significant amounts of capital have been invested in biofuel facilities in the U.S., primarily ethanol, in an effort to gradually move the country away from a dependence on foreign oil. But questions are growing on just how much of the country's fuel needs can be met with ethanol produced from corn and soybeans. There is also criticism that the use of these crops for energy production is driving up global food prices. Some experts have suggested the U.S. needs to take a buckshot approach to developing biofuel sources and work on a number of solutions-not just one. It should not be betting the farm, so to speak, on ethanol from agricultural commodities. One area of technology that is receiving growing interest is biofuel from algae. It has huge potential-and that probably explains why there are a number of companies working hard to develop a technology that can commercially deliver biofuel at a reasonable price. Some of the technologies also offer the opportunity to use the CO2 from the stack gases of coal and natural gas power plants, perhaps helping to address global warming concerns. Research supports the potential for energy from algae, which is commonly known as pond scum. Its production numbers are far from scummy. A study from the University of New Hampshire said that all the transportation fuels in the United States could be supplied by algae grown on less than 30 million acres of desert. That represents an area equal to about three percent of the land currently used for farming crops and grazing for animals. And algae can be quick growing. With corn and soybeans, the growing season is months long. But some algae are so prolific that they could be harvested for oil production daily. There are some very heavy hitters in the energy industry that are interested in producing biofuels from algae. Energy giant Chevron and the U.S. Department of Energy's National Renewable Energy Laboratory (NREL) have entered into a collaborative research and development agreement to study and advance technology to produce transportation fuels using algae. Chevron and NREL scientists are collaborating to identify and develop algae strains that can be economically harvested and processed into finished transportation fuels, such as jet fuel. nearly 20 years, giving us unique insights into the research required to produce cost-effective fuels from algal oils or lipids. Our scientists have the advanced tools and the experience to rapidly increase the yield and productivity of key species of algae." NREL believes algae is a promising potential feedstock for next-generation biofuels because certain species contain high amounts of oil, which could be extracted, processed and refined into transportation fuels using currently available technology. Other benefits of algae as a potential feedstock are its abundance and fast growth rates. Royal Dutch Shell announced last December that it will work with HR Biopetroleum to build a pilot facility for growing algae as a source of biofuels. The facility will cultivate algae in seawater ponds, then harvest the algae and extract oil from them for conversion into fuels such as biodiesel. Construction of the facility has started, on a parcel of land leased from the Natural Energy Laboratory of Hawaii Authority (NELHA), on the west shore of the island of Hawaii. 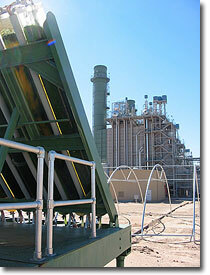 Other energy players are making the move to algae-to-energy. Renewable Energy Group (REG), a leading U.S. biodiesel production and marketing company based in Iowa, recently revealed it has scalable commercialization technology capable of refining and producing large volumes of high quality algae biodiesel. REG has pre-treated and produced high quality algae biodiesel at the pilot scale level with results that it says will lead to commercial production. The company is looking to initiate partnerships for commercial-scale production of algae biodiesel at volumes comparable to those from other vegetable and animal feedstocks now in use. As noted, algae grow rapidly and can have a high percentage of lipids, or oils. They can double their mass several times a day and produce at least 15 times more oil per acre than alternatives such as rapeseed, palms, soybeans, or jatropha. Moreover, algae-growing facilities can be built on coastal land unsuitable for conventional agriculture. The Hawaii facility will grow only non-genetically modified, marine microalgae species in open-air ponds using proprietary technology, according to the companies. 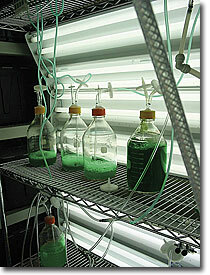 It will also use bottled carbon dioxide to test the algae's ability to capture carbon. Algae-to-energy is also getting attention from high government levels. In a speech to the last Algae Biomass Summit in California, U.S. Department of Energy chief operating officer Paul Dickerson noted that President George W. Bush's Advanced Energy Initiative is a sweeping plan to change energy use, and includes the 20 in 10 plan, which seeks to reduce gasoline use in the U.S. by 20 percent over the next decade by boosting fuel economy standards and expanding the use of alternative fuels. To make that target a reality, the country needs to displace 35 billion gallons of gasoline each year with a portfolio of fuels. It's important to note that while Bush has set an ambitious agenda of developing alternative energy, Dickerson said Bush "continues to be clear that there is no silver bullet waiting around the corner." Nor will there be a silver bullet solution waiting for Bush's successor as president. "There isn't a single solution or technology that will deliver on our goals. Instead, there will be a portfolio of biofuels displacing the 35 billion gallons of gasoline." As with NREL director Dan Arvizu, Dickerson noted that three decades ago the Department of Energy was one of the pioneers in developing algae as a renewable fuel source, with the Aquatic Species Program. Its main focus was producing biodiesel from high lipid content algae grown in ponds, and utilizing waste CO2 from coal-fired power plants. For almost two decades, the program's scientists amassed a collection of 3,000 algae strains. They developed a wealth of knowledge on how to apply biotechnology to enhance lipid production in these strains. They then successfully demonstrated pilot-scale algae growth in bioreactors located in the New Mexico desert. That program ended in 1996, primarily due to costs and the lack of technology which could make "algae diesel" competitive with petroleum diesel, Dickerson noted. The strains, though, which now reside at the University of Hawaii, have continued to serve as the bedrock of evidence for algae fuels-related research. "Today, it's hard not to get excited about algae's potential. Its basic requirements are few: CO2, sun, and water. Algae can flourish in non-arable land or in dirty water, and when it does flourish, its potential oil yield per acre is unmatched by any other terrestrial feedstock. In fact, it could be 30 to 100 times more productive." One of the smaller companies working steadily at developing technology in this area-notably using CO2 emissions-is Massachusetts-based GreenFuel Technologies. GreenFuel's emissions-to-biofuels technology uses safe, naturally occurring algae to recycle CO2 from the stack gases of power plants and other commercial sources of continuous CO2 emissions. In a trial at the Redhawk Power Plant of Arizona Public Service Company, specially designed pipes captured and transported CO2 emissions from the stack to specialized containers holding algae. In the presence of sunlight, the algae consumed CO2. With the GreenFuel model, algae is grown, harvested, and its starches are turned into ethanol, its lipids into biodiesel and its protein into high-grade food for livestock. GreenFuel and APS were able to successfully grow algae at APS' Redhawk natural gas power plant at levels 37 times higher than corn and 140 times higher than soybeans-the two primary crops used for biofuel. GreenFuel CEO Cary Bullock noted that the whole area of producing biofuels from algae has received a great deal of interest in the last few years-and even more interest of late with the rising prices for corn and soybeans. Not to mention gas at $4 a gallon. "Right now, people are looking at high gas prices at the pump and are also looking at the food vs. fuel issue that has arisen," said Bullock, noting that ramping up biofuel facilities using corn and soybeans has its own set of challenges. One challenge is that biofuel produced from corn and soybean can only meet a fraction of U.S. fuel demand. "On a productivity basis, algae offer so much more than other crops," he said. There are also larger, strategic issues for the U.S., he added. "The source of major petroleum deposits tend to be political trouble spots around the world. There is a massive wealth transfer going on, from the developed countries to the countries with oil." All of these issues have people focused on looking for solutions and bioenergy from algae could be part of that solution-possibly a big part. "We believe that if we get commercial systems working, they will be very well received." Bullock said that GreenFuel Technologies is still working on getting its system fully evolved from the laboratory stage. "We're going from labs to modified outside labs to doing pilot projects," he explained. "We are in the process of designing and starting to employ commercial systems. They're much larger than what we have done before, but they are still small commercial systems." A commercial setup would require a good deal of land, said Bullock, and would have to go through permitting, much like a power plant. "It will be 2-1/2 to three years before we get the first ones out there." Sometimes the thinking with new technologies is that they should be moved ahead-and moved quickly-to create some momentum and critical mass. People are looking for quick solutions to the current situation about high energy prices, and declining supplies of oil, said Bullock. "I think the challenge we've had at GreenFuel is in keeping it going slower. The market, to a very great degree, is willing to pull you along. If you're not careful, it can pull you along way faster than you should be going." The company recently completed one milestone-obtaining $13.9 M in venture capital. GreenFuel intends to use these funds to prepare for algae farm technology development and scaling up projects. The next milestone, Bullock said, is to get a completely commercial system up and running. In terms of partnering with other companies, Bullock said it is important that potential partners understand what the risks are. "You're not offering them a sure thing, you're offering a possible way to solve a problem. "They need to know that when you do something like this for the first time, you run into issues that you have never seen before-you have to sit down with cool heads and solve them." To a degree, there is a sense of excitement at the company-but they are very realistic about this being a medium to long haul, says Bullock. "Two to three years is not long in this process," he added. "It has to be thought of in timeframes of upwards of 30 years, or even 50 years." Along the way, they want to enlist more partners and expand it in different areas. "The excitement is you end up making a real difference."